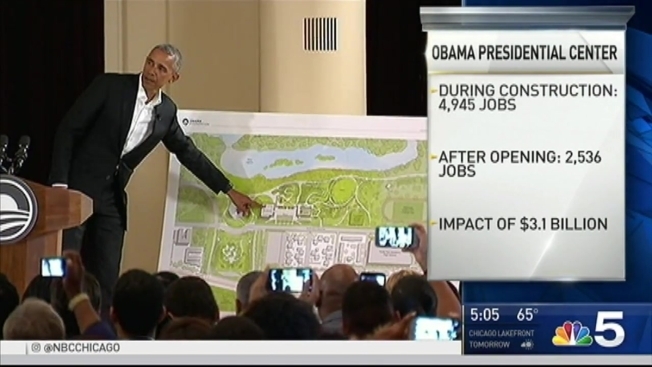 According to an Economic Impact Assessment commissioned by the Obama Foundation, the new Barack Obama Presidential Center is projected to have a massive economic impact on the South Side of Chicago. The study, released Thursday, is projecting that nearly 5000 jobs will be supported in Cook County during the construction phase of the project, which is based in the Jackson Park neighborhood. After construction is complete, 2500 jobs are projected to be supported both in the building and in the surrounding areas, according to the study. “We know from experience that public and institutional investments attract private capital to neighborhoods, and this report highlights the Obama Presidential Center’s significant projected economic impact that will complement and accelerate the investments we’re making on the South Side,” Chicago Mayor Rahm Emanuel said in a statement. The big projections don’t stop with jobs either. According to the study, the economic impact of the center is projected to land around $3.1 billion over the construction phase and in the first 10 years that the center is open. That figure is closer to $2.1 billion on the South Side over the same time frame, and the Obama Foundation’s CEO said that figure is part of the reason why the former president and first lady picked the South Side as their location. The Obama Presidential Center is expected to be completed by 2020 or 2021, according to estimates.